Scalability. The largest networks are struggling to process the ever increasing number of transactions. Congested networks become slow and expensive. With the current block times, existing public networks are very, very far from being able to run apps with millions of users and serve the practical needs of businesses. Connectivity. Each blockchain now has to create the whole ecosystem with its users, DApps, and a native currency. Existing blockchains operate in silos and do not communicate with each other. Switching and transferring assets from chain to chain is hard, if possible at all. Such lack of interoperability is a big impediment to the mass adoption of the technology. The issues of scalability and connectivity are intertwined by nature: enabling connectivity among blockchains can be viewed as a path to blockchain scaling. The main Ethereum scalability solutions, like Plasma and sharding, assume running parallel chains (“parachains”) or chain partitions (“shards”) that can communicate with each other. While potentially powerful, these solutions require an extensive implementation schedule. Three or four years ago there was this belief that everything on a blockchain should be done on the one chain. This is how we ended up with solutions such as bitcoin, or Ethereum where all the transactions and smart contracts are executed on the one network. Now as long as this is all secured through the decentralised consensus, then that works out pretty well because you can verify everything cryptographically; all through this one decentralised blockchain. What’s wrong with having one blockchain? Back in 2014, when people were particularly excited about Ethereum’s then-new Turing completeness, the platform was widely perceived as the all-encompassing blockchain that would take care of it all: transactions, smart contracts, and decentralised applications. Then the infamous DAO attack happened and one of Ethereum’s weaknesses; the possibility of the network’s basic failing in terms of governance - was vividly exposed and the network’s “guidelines” restricted developers. One could not alter rules, implement changes, and test them out quickly and there was always the need to maintain consensus. Having a multitude of blockchains, on the other hand, which could all serve different purposes, was suddenly considered beneficial. And the only thing lacking, the industry leaders felt, was the functionality to make blockchain networks interoperable. What we need to make sure of though is, if there is multiple blockchains out there, then they should all talk to one another in a standardised way and transfer value from one chain to another with relative ease. This is what crosschain protocols are seeking to do. They are looking to standardise the way the blockchains are written and secured just like the way you use the Internet today. Crosschain protocols, referred to as an ‘Internet-of-blockchains’, is really a network of blockchains which are all interoperable in that they can communicate to one another because they're all built in a standardised way. If technology can achieve this goal, then we are able to speed up innovation because people are innovating on individual blockchains which also means that they can talk to one another and scale together. Deloitte published its 2018 tech trends and blockchain connectivity was one of the most mentioned topics in the report. “Though a lack of standardisation in technology and skills may present short-term challenges, expect the broader adoption of blockchain to advance steadily in the coming years,” the report contends. If you want to move value across chains, you must do so by moving tokens into a centralised exchange, trade on the exchange's in-house ledger and then withdraw the new asset on a new chain. This process is slow, expensive and involves substantial counterparty risk. The blockchain space has already seen several DEXs of the multi-blockchain-asset variety, including Bitsquare, Bitshares (Openledger), Fusion, SuperNET (InstantDex). Oasis and Counterparty are examples of blockchain-specific DEXs for Ethereum and Bitcoin meta-tokens, respectively. All of these platforms suffer from extremely low liquidity compared to the centralised alternatives such as Poloniex and Bitfinex. A number of high-profile projects such as polkadot, Block Collider, Cosmos and Fusion are vying to be the meta "blockchain of blockchains." Each of these systems has a native staking token that validators must stake in order to perform work for their respective networks. Other players include Aion, Lamden, Metronome (focused on cross-blockchain currency), and a totally open protocol put forth originally by Ripple called the InterLedger Protocol. Jae Kwon originally developed Cosmos, which is a network of blockchain hubs and helps them all to connect to one another. The key goal is to allow for the transfer value, e.g. tokens from one chain to interact with each other, with low transaction fees and in a scalable way. The blockchain is built on top of Cosmos, and use proof of stake model with a security layer for their consensus, to reduce the inefficiency of proof of work, with its components built on open source under the Apache two licence. The Cosmos network consists of many independent, parallel blockchains, called zones, each powered by classical Byzantine fault-tolerant (BFT) consensus protocols like Tendermint. Some zones act as hubs with respect to other zones, allowing many zones to interoperate through a shared hub. The architecture is a more general application of the Bitcoin sidechains concept, using classic BFT and Proof-of-Stake algorithms, instead of Proof-of-Work. Cosmos can interoperate with multiple other applications and cryptocurrencies, something other blockchains can’t do well. By creating a new zone, you can plug any blockchain system into the Cosmos hub and pass tokens back and forth between those zones, without the need for an intermediary. For example, if you wanted to trade bitcoins for ether, you would have to sell your bitcoins for a fiat currency on an open exchange and then use that fiat currency to buy ether on another exchange. The problem is, many of our exchanges today are plagued by hacks, theft, and cons. Two prime examples are what happened at Mt. Gox and more recently Bitfinex. Cosmos network also has its own ATOM token which is used for participating in the network. Secondly the tokens are used to pay transaction fees by anyone interacting on the network and transferring value from one chain to another. Cosmos validators are essentially the miners, the people who get right into the blockchain -- they can write in the blockchains of the individual zones or they can actually write into the hub itself. In order to become a validator you have to stake a bunch of the ATOM token to get that privilege. Initially there will actually be a hard cap of hundred validators per zone or on the hub itself and this is to guarantee the speed of the network. If you have too many validators then the network will become slower but as the technology improves obviously they will be able to increase this limit. Additionally anybody who is holding ATOMs can delegate those tokens to a validator, and for the work that validator is doing, they end up receiving a portion as a transaction fee. Founded by DJ Qian, the man behind popular platforms QTUM and VeChain, Fusion is an inclusive platform that utilises the blockchain’s smart contracts to create an interoperable and highly connected blockchain ecosystem. The platform is an open code public blockchain, and it’s maintained by the Fusion Foundation and its core community. Fusion is a public blockchain devoted to providing cross-chain and cross-organisation solutions. In other words, it aims to create a way to transfer value between assets, whether centralised (stocks, bonds, other traditional financial assets) or decentralised (blockchain tokens and cryptocurrencies). "We are entering an exciting new era of ‘Internet of Values’ which promises increased connectivity and inclusiveness," said Dejun Qian, "However, the benefits of the Internet of Values are currently thwarted by interoperability, scalability and usability issues within the various blockchain ecosystems, all of which combined have hindered this technological progress. FUSION aims to remove these barriers, ushering in an age of a true digital economy." Let us take a look at a quick example. Typically, in order to participate in ICOs, you not only relied on third parties to get Ether, but you also paid a fee. 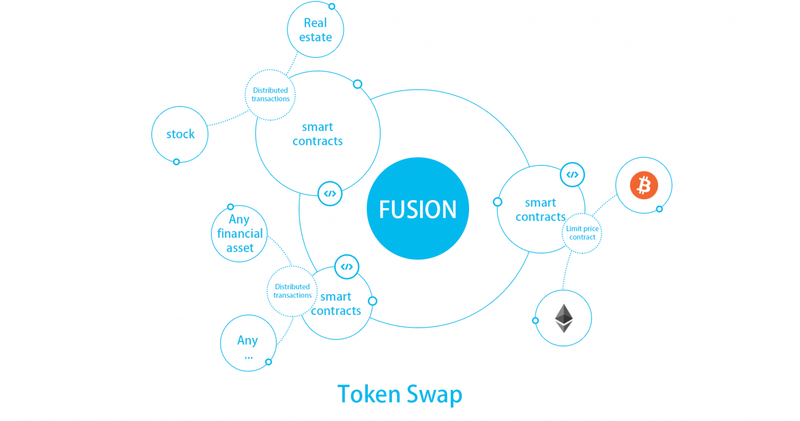 Using the FUSION blockchain, on the other hand, you are able to send any token of your choice to the FUSION smart contract, and the startup/company is able to convert to any cryptocurrency that was mapped/stored/deposited onto the FUSION blockchain instantly via atomic swaps, like the lightning network. This is why Fusion is also known as a blockchain that supports cross chain. The Fusion network will accomplish its goals by letting APIs aggregate different blockchain tokens, off-chain values, and data sources into one public blockchain. Thus a variety of tokens and assets can be mapped onto the blockchain, making it possible to create multi-coin smart contracts so users from different blockchains can interact with each other on a trustless basis. Fusion is, in a sense, a “blockchain of blockchains.” In terms of security, the platform implements a proprietary piece of technology called Distributed Control Rights Management (DCRM). DCRM distributes the control of private keys throughout the public blockchain.This ensures that no single entity can access the complete private key, and therefore no single node can take full control of the network’s digital assets. The solution is future-proofed, as Fusion supports both tokens that are already in circulation and those that will be issued in the future. The platform offers — among other things — a multi-currency loan system, by which users can apply for a loan in one form of token and pay it back with another. Polkadot is a creative commons protocol specification and a free and open source licensed project. It is a complementary protocol that will allow for different blockchains to leave their silos and interact seamlessly. How does Polkadot achieve its goals? As Peter Czaban would say, “it’s a minimal global consensus layer, a future resistant way of enabling all autonomous agents to collaborate using rules executed by arbitrary state machines”. But what about the rest of us that speak actual English? Well, what it does is allow for an easy solution to scaling by allowing multiple chains to share the same security layer without having to accrue mining resources themselves (the main challenge to the simplest chain scaling solution), AND without having to resort to merge-mining either. In other words, Polkadot is an innovative way to connect the hundreds of different technologies out there to each other. An “Internet of Blockchains” might be an adequate albeit slightly crude description. To quote Sunny Aggarwal, “a pluggable consensus network” — essentially each parachain gives up sovereignty in deciding chain finality in exchange for being able to talk to each other as part of a constellation of blockchains and other consensus at scale solution. The Lightning Network is in many ways the grandfather of the cross-chain transaction. A draft version of the white paper was released in January 2016, but since then, it has become the face of “cross chain atomic swaps”, whereby two users can directly exchange currencies of different blockchains. It enables users to make transactions across their respective blockchains, all without trust in third party mediators (brokers, exchanges, etc.). Like Ripple, the Lightning Network takes a narrower approach to financial transactions, in contrast to FUSION. It specifically targets individual transactions to enable instant payments across a broad network of participants. Unfortunately, the Lightning Network requires users to maintain their own private keys, making security a potential issue. There are several threads and discussions asking why private keys must be held on an online device in order to use the network. In terms of the private key mechanism, the Lightning Network doesn’t provide a Fusion-like security protocol. These are both chains that don't support Turing-complete programming languages. Cross-chain atomic swaps will be technically easier to implement between general-purpose smart contract platforms. It will take another one or two years for these libraries to mature and become widely adopted, but they will. There aren't many technical questions remaining. The other major challenge with cross-chain atomic swaps is price discovery and order matching. That's where decentralised exchanges (DEX) such as 0x and OmiseGo come into play. OmiseGo is fully decentralized, meaning that the order book lives on chain. In 0x, orders are hosted by relayers (centralised entities), who then submit matched orders to the chain for settlement. If the market ultimately demands DEXs to be fully decentralised - including on-chain order books - then systems like OmiseGo will be necessary for cross-chain atomic swaps to function. Image Credit: Hero: The Web 3.0 Abstracted Stack by @stephantual, 26 May, 2017.